We’d love your help. Let us know what’s wrong with this preview of George Orwell by Bernard Crick. Bernard Crick's biography of George Orwell published in 1980.A scholarly book with numerous photographs,notes and an index.Seventeen chapters 589 pages. To ask other readers questions about George Orwell, please sign up. Re-reading this, it strikes me that I probably need to re-read most things which probably rules me out of new books for the next thirty years. A brilliant biography, complete with an introduction that should be (it probably already is) required reading for anyone contemplating writing this kind of book. Orwell requested in his Will that no biography be written, and thought that a truthful biography was impossible because "every life viewed from the inside would be a series of disappointments too Re-reading this, it strikes me that I probably need to re-read most things which probably rules me out of new books for the next thirty years. A brilliant biography, complete with an introduction that should be (it probably already is) required reading for anyone contemplating writing this kind of book. Orwell requested in his Will that no biography be written, and thought that a truthful biography was impossible because "every life viewed from the inside would be a series of disappointments too humiliating and disgraceful to contemplate". He didn't get his wish, but he did get a careful biographer who goes to some lengths to check facts and conventional wisdom. - Ulysses influenced him greatly as he dismissed how it was originally received - "art implies selection...Joyce is attempting to select and represent events and thoughts as they occur in life and not as they occur in fiction"
- he and H.G. Wells had the most enjoyable disagreement over lunch in which Wells was called out on his debating technique: "every time I try to tell you how, you ask me what; and every time I try to tell you what, you ask me how"
- at a lunch he spied Kingsley Amis and asked his friend to to switch seats so that he didn't have to look at "that corrupt face"
- his values may have remained optimistic, but his expectations became pessimistic - "he was a moderate only as a means, not as an ends"
- he could deliver a mean aphorism: "at 50, everyone has the face he deserves"
finally finished with this very heavy book. it was an intersting read, probably one of the best biographies on george orwell out there, but also a strange way of writing. the author writes in an old fashioned way which just makes me unsure on what the main focus in a lot of the sentences are. i am glad i read this, as i learned a lot about orwell. but at the same time i think this book needs a revamp and some modernisation. however, i bought it for 2 quid from cambridgeshire county library's with finally finished with this very heavy book. it was an intersting read, probably one of the best biographies on george orwell out there, but also a strange way of writing. the author writes in an old fashioned way which just makes me unsure on what the main focus in a lot of the sentences are. 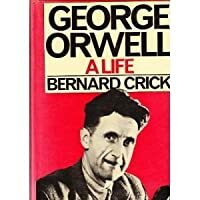 Bernard Crick’s biography of George Orwell, titled George Orwell: A Life, was originally published in 1982 and was the first biography to be written with the cooperation of Orwell’s widow. This new edition, scheduled to be released on May 30, 2019, continues to show the increase of interest in Orwell and his writings, no doubt due, at least in part, to the current political climate around the world. A lot of people are feeling as if we are seeing Orwellian politics at work in our systems of gove Bernard Crick’s biography of George Orwell, titled George Orwell: A Life, was originally published in 1982 and was the first biography to be written with the cooperation of Orwell’s widow. This new edition, scheduled to be released on May 30, 2019, continues to show the increase of interest in Orwell and his writings, no doubt due, at least in part, to the current political climate around the world. A lot of people are feeling as if we are seeing Orwellian politics at work in our systems of government and that makes reading work by or about Orwell seem almost comforting in its prescience. Bernard Crick’s writing, while seeming often archaic, betrays a unique understanding of the man Orwell, and spares no expense in attempting to communicate that insight to the reader. George Orwell: A Life gets five stars for being a meticulous, well-presented biography, and any student of Orwell would do well do pick up this new edition. I feel like I deserve a little 'hallelujah' for finishing this book. It's not the first biography on Orwell I've read, so I have a bit of experience. I must say the first half (sadly, not the one I needed) was more interesting. I had the impression that Crick inserted many unimportant details, events from Orwell's life. I mean, yes, they might have been interesting for someone living in that period who knew the other journalists/writers, but I think for today's man they don't seem essential. Howev I feel like I deserve a little 'hallelujah' for finishing this book. It's not the first biography on Orwell I've read, so I have a bit of experience. I must say the first half (sadly, not the one I needed) was more interesting. He clearly was able to do a lot with the information he found, but I still found the book somewhat lacking and overdone at some parts. Still, it's very helpful to put Orwell's writings into some context (that you can't find in the Complete Works). This is a good biography of Orwell, one that provides what is still the best analysis of his politics. It takes a brave author to directly contradict Orwell's last request that no biography be written about him, but we should all be very thankful Crick took up the gauntlet! His biography of Orwell's life is one of the most insightful and thoroughly researched I've read ; bringing highlights of his letters and essays together with personal recollections from friends and Crick's own analysis of some of the more troubling aspects of an extraordinary life. It's balance of describing the political and p It takes a brave author to directly contradict Orwell's last request that no biography be written about him, but we should all be very thankful Crick took up the gauntlet! It's balance of describing the political and personal endear it to both fans of Orwell looking for detail on his ideas and what shaped them , but also to the more casual reader who perhaps is newer or unfamiliar with his works. The only area in which I feel Crick lets this great book down slightly is a tendency to try and justify some of the more uncomfortable moments of Orwell's life - for example troubling stories about his almost assault of a female acquaintance, or references to violent tendencies. Whether these occurred as described or not, the author does lean towards immediately discounting or trying to justify them , when it could be better left to the readers own analysis. As the author admits, a biography that concentrates on the facts (as the writer sees them) with little insight into Orwell's personality. That said, it was a full life of the man and a great read. Still by far the best Orwell biography. DJ Taylor's is too slight. Jeffrey Meyers - an American - has more facts, but can't get over his urge to piss over everything like a poorly-trained puppy. I have huge admiration for Orwell and he must have been an incredible man, but unfortunately this biography is rather dull. This is a wonderful biography of Orwell, considered the finest, I believe. I just didn't have time to finish it, and wanted to get it off this list. (So I don't look illiterate). Sir Bernard Rowland Crick was a British political theorist and democratic socialist whose views were often summarised as "politics is ethics done in public". He sought to arrive at a "politics of action", as opposed to a "politics of thought" or of ideology.